Drinking In the Holiday Cheer: Four Faves! I was in my usual zoned-out state at the grocery store the other day picking up a few necessities—coffee, pasta, milk—and trying to decide what to make for dinner. Walking past the butcher case, I saw chuck roast for $6.99 per pound from Oregon Country Beef, a co-op of ranchers that, despite the name, sources its beef from well beyond Oregon's borders, including ranches in Washington, Idaho, Nevada and California. Oregon Country Beef cattle finished in a feedlot. According to the company, the co-op's cattle start their lives on pasture and are raised on rangeland for most of their first 14 to 18 months,* then are shipped to a feedlot for "finishing" on a diet of non-GMO wheat, barley and potatoes (photo, left), a four-month process that fattens cattle to increase their weight before slaughter. Carman Ranch cattle live their lives on pasture. Then I saw there was a special on—be still my heart—short ribs for just a buck more per pound. Even better, they were from Carman Ranch, a grass-based ranch in Oregon's Wallowa County where Cory Carman raises cattle on the land that's been in her family for more than 100 years. 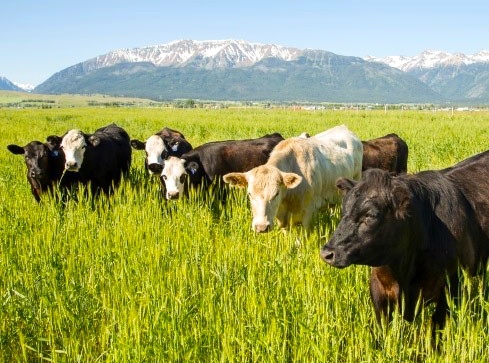 Her cattle spend their entire lives right up to the point of slaughter on its broad pastures at the base of the Wallowa Mountains (photo, right), and the regenerative practices she champions sequesters carbon in the soil and produces more nutrient-dense, leaner meat. While I commend the fact that the chuck roast came from cattle raised on non-GMO feed, those short ribs were singing their green-green-grass-of-home song. 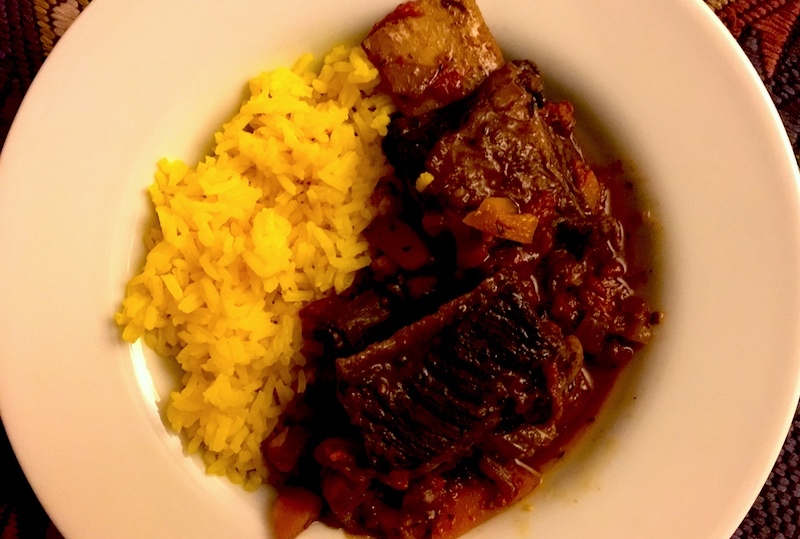 I brought four pounds home, sautéed a base of vegetables—call it mirepoix (French), sofrito (Spanish), soffritto (Italian) or even włoszczyzna (Polish)—then added roasted tomatoes and red wine along with the short ribs. Ninety minutes later this ultimate comfort food dinner was meltingly tender, and looked (and tasted) stunning served alongside my friend Kathryn's saffron rice. Heat olive oil over medium-high heat in large braising pot or Dutch oven. When it shimmers, add onions and sauté until translucent, then add celery, carrots and garlic and sauté until tender. Add tomatoes and red wine and bring to a simmer. Add short ribs and herbs, bring to a boil, then reduce heat to simmer for 90 minutes to two hours until meat is very tender and almost falling off the bones. Add salt to taste and serve over saffron rice or with boiled or mashed potatoes. * Conventionally raised cattle—those that are born and live on pasture for their first few months and are then moved to feedlots where they're typically fed a diet of GMO corn and soy laced with antibiotics and sometimes growth hormones—are generally slaughtered at one year to 18 months old, depending on their weight. 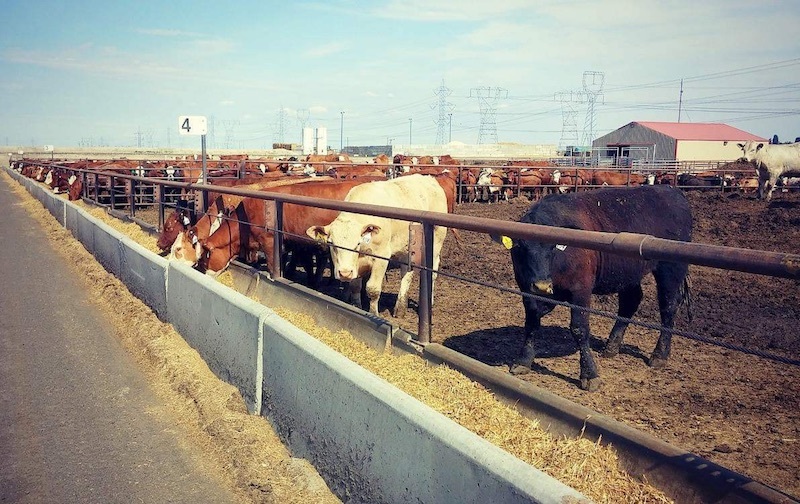 Photo of Oregon Country Beef cattle at a feedlot from Newport Avenue Market in Bend. Photo of Carman Ranch cattle from its website.